The Dutch Republic — officially known as the Republic of the Seven United Netherlands, the Republic of the United Netherlands, or the Republic of the Seven United Provinces — was a republic in Europe. It was a confederacy of provinces,from 1581 to 1795. 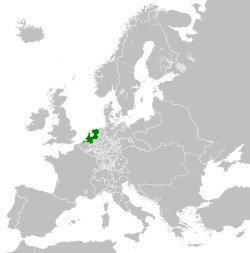 It came before the Batavian Republic, the United Kingdom of the Netherlands and the modern Netherlands (now a part of the Kingdom of the Netherlands. Alternative names include the United Provinces, Federated Belgic Provinces, and Belgic Federation. Although it was called a republic, its Stadtholders became a heredity dynasty. ↑ NTR, Omroep. "Waarom vormen de Noordelijke Nederlanden een republiek?". NPO Focus. ↑ In full concordia res parvae crescunt, discordia maximae dilabuntur. Hubert de Vries, Wapens van de Nederlanden. De historische ontwikkeling van de heraldische symbolen van Nederland, België, hun provincies en Luxemburg. Uitgeverij Jan Mets, Amsterdam, 1995, pp. 31–32. ↑ Demographics of the Netherlands, Jan Lahmeyer. Retrieved on 10 February 2014. This page was last changed on 14 February 2019, at 14:03.